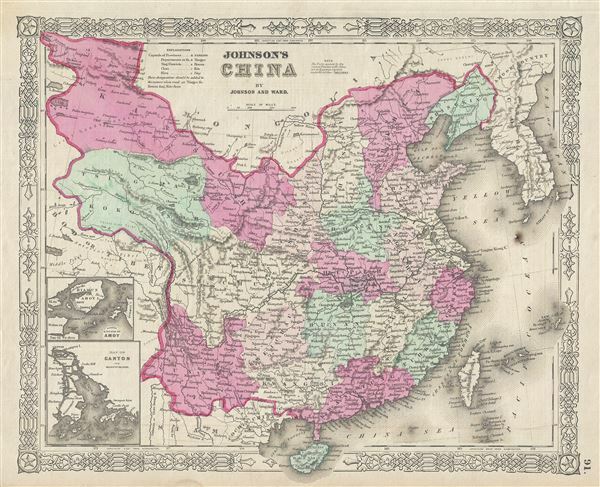 This is Johnson and Ward's 1863 map of China, covering from Mongolia to Hainan and from Tibet to Korea. The map identifies both the Great Wall and the Grand Canal. It depicts the region with particular attention to cities and waterways. China at the time this map was made was a mostly closed country, however, a few ports were opened to western trade and are noted in capital letters and include Tanchau, Kaifung, Waingan, Shanghai, Canton and Nanking (Nanjing) among others. Insets detail the 'Island of Amoy' and Canton (near Hong Kong). Taiwan or Formosa is mapped vaguely, representing the poor knowledge of the region prior to the Japanese invasion and subsequent survey work in 1895. The map identifies both Hong Kong and Macao. The disputed body of water between Korea and Japan is here identified as the Sea of Japan. Various towns, cities, rivers and several other topographical features are noted with relief shown by hachure. This map features the fretwork style border common to Johnson's atlas work from 1863 to 1869. Published by Johnson and Ward as plate no. 91 in the scarce 1863 edition of Johnson's Family Atlas. Johnson and Ward, Johnson's New Illustrated (Steel Plate) Family Atlas, (1863 edition). Very good. Text on verso. Minor spotting here an there. Rumsey 0352.069 (1864 edition). Philips (atlases) 843.